Their fate's in our hands! It’s Saturday, Jan. 28, at 11:30 a.m. when I arrive at 672 Higuera St., where artists have been arriving since 8 a.m. to pay $25 to enter up to three pieces in a juried art show. The space, nestled between Tom’s Toys and West End Coffee, is chalk full of art: paintings stacked against walls, tables filled with three-dimensional pieces, freestanding sculptures making a maze out of the floor space. 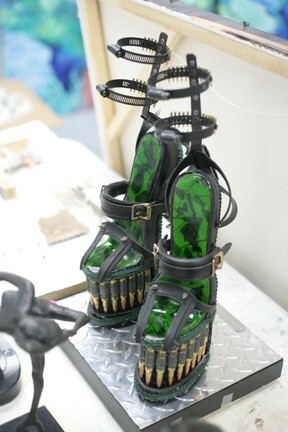 CRUEL SHOES : Festooned with bullets, hose clamps, and switchblades for heels, these shoes are to die for. 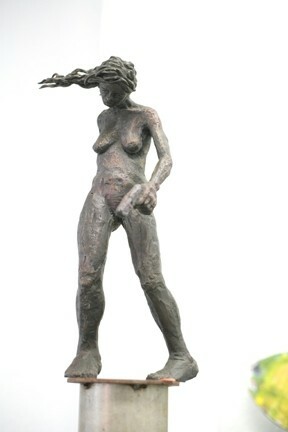 GUN MOLL : The judges liked this gun-toting gal as well as a similar sculpture with a gun-holding arm coming out of a woman’s neck. Retired SLOMA curator and Cuesta Gallery director Tim Anderson, KCBX’s “Ears on Art” co-host Steven deLuque, and yours truly have been honored with the duty of being the first jury panel for what will be an ongoing series of art shows located in vacant urban retail spaces. Over the next 90 minutes, we’ll be elating and deflating the egos of artists—not a task I relish! Organizers are trying to hustle out the last lagging artists so we can begin our blind jury duties. We don’t know who did what since all the entry forms have been obscured from our view, but our job is to sort through the dozens upon dozens of works and cull the number down to something appropriate for the gallery space. No small task, since as we look through the work, there are few pieces easy to dismiss outright. “Wow, I can’t believe how many artists there are who’re desperate for a place to show their work,” I say. “That’s the nature of our community,” Tim laments. DON’T JUMP! 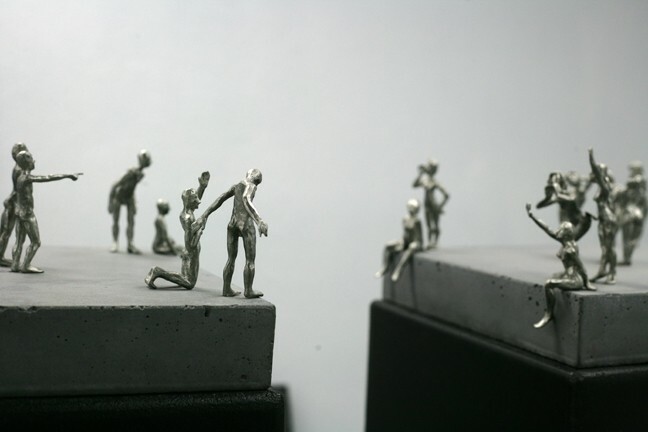 : This sculptural diptych features gestural little people playing out a scene divided by a chasm. 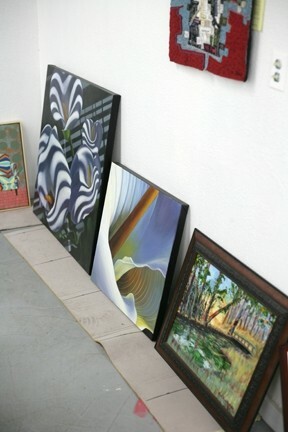 CHOICES, CHOICES : We had a lot of quality work to choose from, a lot more art than the space could hold. Ka-pow! She blasts past me, sets her work on the table as I repeat that we’re just the jury and she’s too late. “No, the cutoff is at 12:30,” she protests. “No, it was at 11:30,” I say. Artists! Harrumph! She storms out! Tim, Steven, and I continue to make our way through the art, placing little colored stickers on the ones we like best. Then we go around to determine whether we don’t like any of the ones our fellow jurors picked, discussing as we go. It’s democracy rules, so we decide at least two jurors have to like every piece we retain. We discuss variety, 2-D to 3-D ratio, our desire to make sure craft is represented, and—most importantly—how we want to come to the art opening but may risk death threats since, you know, any of the artists whose work we don’t pick will think we’re a trio of ignorant douchebags. 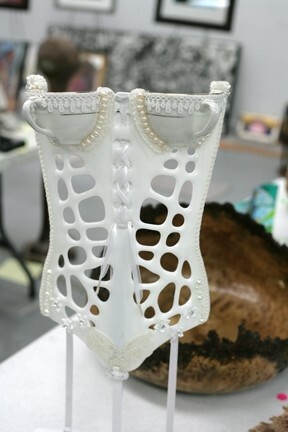 TEACUPS : This porcelain corset cleverly uses teacups for B-cups. PHANTOM OF THE ART-RA! : The San Luis Obispo Museum of Art (SLOMA) embarks on a new series of art shows called The Phantom Project, which feature month-long shows located in vacant urban retail space. The first show is at 672 Higuera St. (thanks to Quaglino Properties) and opens on Thursday, Feb. 2, from 4 to 9 p.m. There’s an opening reception during Art After Dark on Friday, Feb. 3, from 6 to 9 p.m. The show closes during Art After Dark on Friday, March 2, from 6 to 9 p.m. I make a secret pact to blame Tim and Steven for any slight to any artist. Yes, I’m going straight to hell. It’s now almost 1 p.m., and the event organizers have returned for the difficult task of informing the artists not selected that their work is awaiting pick up. Can you imagine? Sitting there over the next two hours as unloved artists return to drag home their art that they totally poured their hearts and souls into? Yikes! I gotta get the hell out of here!